I think there is one major difference between the Northeast and the South (the only two regions in which I've lived) when it comes to sports. In the Northeast, fan alliances are primarily geared towards professional teams, while in the South, alliances are typically based upon collegiate teams. Please note that I have not forgotten the Ohio State-Michigan rivalry, I just don't consider it geographically relevant at the moment (either way, ESPN has already chronicled that rivalry's dating rules). One element that seems to cross geographical borders is the notion of dating someone who roots for/attended a rival team/school. But for all the t-shirts espousing the idea (FSU normally carries several in its various bookstores), I think the Boston Bruins have put the most daring foot forward in pleading for its fans to avoid romantic relationships with rival sports fans. Exhibit A is an advertisement that aired at the beginning of the 2009-2010 season. 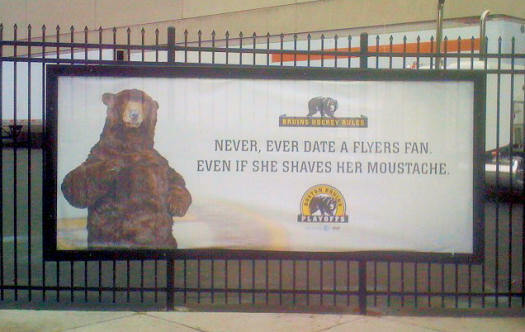 Exhibit B is a billboard that was recently spotted outside of the Bruins' TD BankNorth Garden. It's all the more relevant since the Bruins are currently playing the Philadelphia Flyers in the NHL's Eastern Conference semifinals. Clever gamesmanship, but does it say anything about the interconnectedness of sports, relationships, and gender roles? The FSU t-shirt seems to suggest that a father wouldn't allow his daughter to date someone who wasn't from FSU, while the two Bruins ads seem to also favor power in the male side of the relationship...as in, "Hey guy, there's never a good reason to date a girl who is a Canadiens/Flyers fan." Understandably, most sports audiences are male, so these ads play upon that dynamic. Yet, if you're not taking these ads seriously, what is the message that the Bruins are trying to instill? Is it a depth of fanship that is implied? Some interesting food for thought.